1-room apartment 90 m2, on the ground floor. Large living/dining room with 1 double sofabed, open-hearth fireplace and satellite TV. Gallery with 1 french bed. Kitchenette (4 hot plates). Shower/bidet/WC. Air-conditioning. Barbecue. Facilities: Internet (WiFi, free). The kitchen has a door to the private panoramic garden. 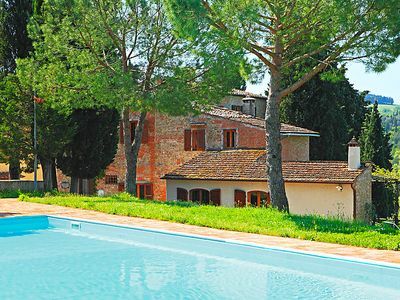 It is an agricultural estate of 50 hectares surrounded by woods, olive-groves and vineyards and close to the cities of art. 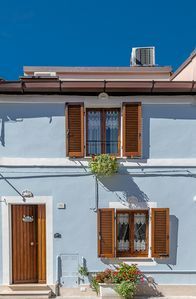 Accommodation is in various buildings, which make up a tiny village (where the owners -who speak english, german and french- also live) and which have been renovated maintaining the original features of tuscan farmhouses. Electronic gate. All the flats have central heating, antique furniture, while each has its own private garden space with barbecue. Large open areas, hiking footpaths within the grounds (5 km), covered shaded car-park and public telephone. Wine and olive oil may be bought. Winetasting and dinners can be organized on request. Laundry on request for the second week €5 per person. 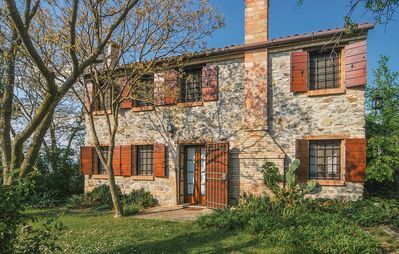 Poggio Nardini also offers cultural facilities: lessons in Italian language and literature, guided tours of the art centres of Tuscany, musical evenings and meetings with theatre actors, guided tours of the ceramic museums and workshops. Large working farm Il Poggio. 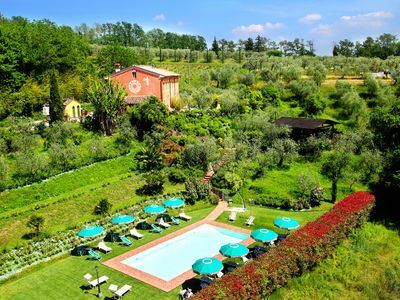 4 km from the centre of Montelupo, 20 km from the centre of Firenze. For shared use: property, swimming pool (14 x 6 m, depth 130 - 250 cm, 25.04.-03.10.). Children's playground. In the house: washing machine (for shared use), heating to be paid on the spot (01.11.-15.04. ), heating available only from 01.11. to 15.04.. Parking. Shop 1 km, railway station Montelupo Fiorentino 4 km. Tennis 4 km, riding stable 10 km. 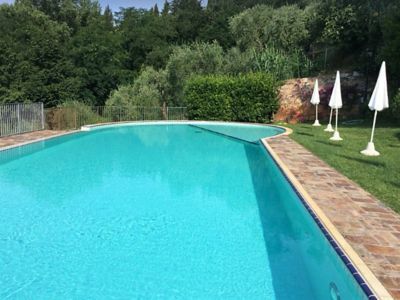 Villa Geko in Tuscany, surrounded by the greenery, with 8 bedrooms, it can host 16 people.